​This Noticeboard is for public notices specifically issued by Piddington Parish Council. This application was considered by Cherwell District Council’s Planning committee and was refused on 16th February 2018. The Applicant, Mr Foster, has appealed this decision. Following a village meeting, the Parish Council has instructed a barrister – Richard Langham – to act for it and present its case at the Public Inquiry, which will start on 26th March. The Inquiry is expected to last for 5 days and the Chairman and Vice Chairman of the Parish Council – Francesca Darby and Pam Feltbower – are giving evidence on the Parish’s behalf. The Planning Inquiry will be held in the Council Chamber at Cherwell’s offices – Bodicote House Banbury. Anyone can come along and watch. The Planning Officer's report on this application for a gypsy/traveller site on Widnell Lane has just been published. On this occasion his recommendation is to APPROVE the application. However, this is just his recommendation - it is the Planning Committee who will make the ultimate decision at their Planning Meeting on Thursday 15 February at 4 pm. Further information about the report and the meeting is contained in the three sections below. The Planning Officer's full report, in which he recommends approval for the proposed gypsy/traveller site on Widnell Lane, can be read here. The email addresses of our District Councillors, the Head of Cherwell District Council, the Planning Officer for the application, the Planning Office and all of the possible members of the Planning Committee on Thursday 15 February can be found here. An information leaflet is being distributed to all households in the village giving information about the report and how individuals can make their voices heard, together with details of the Planning Meeting. 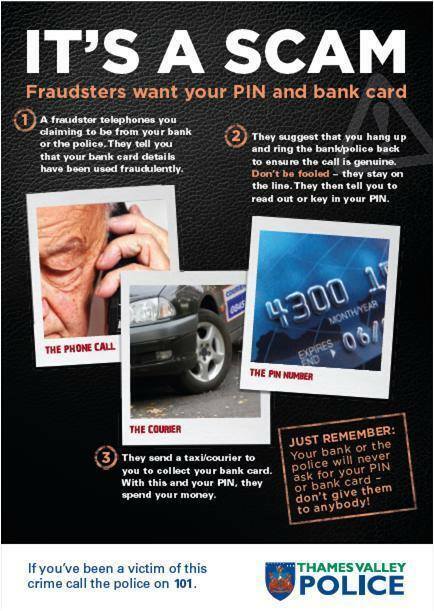 A copy of this leaflet can be found here. A new planning application for a gypsy/traveller site on Widnell lane was submitted to Cherwell District Council in September 2017. The Parish Council held an open meeting in the Village Hall on Thursday 19 October 2017 for the village to discuss this. On 2 March 2017, the Parish Council submitted its formal objection to Planning Application 17/00145/F: 'Change of use of land to use as a residential caravan site for 16 gypsy/traveller families, each with two caravans, including improvement of access and laying of hard standing'. It is now on the planning portal with all the other objections and comments, but you can also read it here. There was an excellent turnout for last night's meeting to discuss Planning Application 17/00145/F: 'Change of use of land to use as a residential caravan site for 16 gypsy/traveller families, each with two caravans, including improvement of access and laying of hard standing'. Around 130 people attended, to hear what information the Parish Council had about the application and an outline of PPC's planned objection to it, and to voice their own views and suggestions for action. PPC will be issuing an update very soon, but in the meantime we urge you to lodge your own comments with Cherwell DC on their website or in writing. And finally, if you'd like to be kept informed about the latest developments, and you haven't already signed up to Piddington Parish Council's email service (whereby it alerts residents to urgent or important things by email), follow the link below to download the sign-up form and the protocol under which we look after your email address. Thank you for all your replies and general support. The parish council met last night for an informal discussion. The debate was positive and our clerk is already working on the framework of a reply to the application. The council will be holding an open meeting on FRIDAY 10TH FEBRUARY @ 7.30pm in the village hall to outline their objection and discuss any further developments. It's hoped there will be a pop up pub afterwards. Leaflets to this effect will be distributed around the village over the next couple of days. Our clerk has already contacted the Garrison Commander, the Governor at Bullingdon Prison and BBOWT at Meadow Farm. We will also be writing to the parish councils of Arncott, Ambrosden and Blackthorn with an invitation to the meeting. If you have friends in any of these villages please make them aware of the application. PPC encourage everyone in the village to lodge their comments with Cherwell DC on their website or in writing. Successful campaigns are those showing a commitment from the whole community. The deadline date has been extended to 24th February as the notices will not go out on site until this week. In writing your comments we urge you to focus your argument on the planning issues. Whilst sympathetic to your anger the planning panel will not take this into consideration when making their decision. I have attached an overview of the current situation which includes extracts from Cherwell's Local plan alongside some observations made last night. I hope it is helpful. Otherwise please wait until the open meeting when we will discuss the issues in more depth. We hope to have a couple of computers on site so that individuals uncomfortable with sending comments using the planning portal can be helped on the night. If everyone on this list writes a comment there will be nearly 70 objections. Our aim is to achieve 100!! We are hoping that Simon Holland will attend the open meeting. That's it for now. Be assured that your council will be working over the next few days on a plan for action. All we ask is that everyone stays vigilant. If you notice any changes at the location or vehicles parked on site let us know asap. Otherwise we will see you at the open meeting. Don't forget to advise friends and neighbours. The parish council has just received a notification for a planning application for a gypsy/traveller caravan site on Widnell Lane. 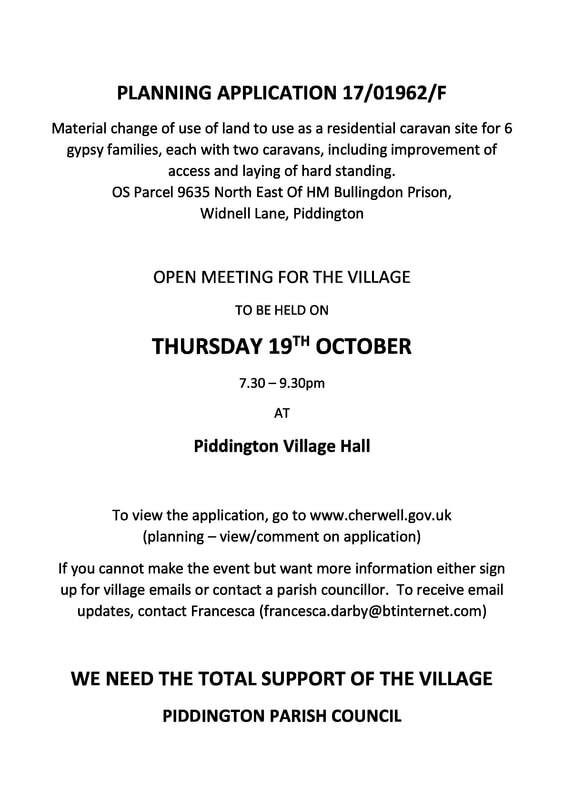 Please see the details below with a link that takes you to Cherwell's planning portal where you can see the full list of documentation. At this point in time the council have contacted our three district councillor's for a brief on Cherwell's position on the development of agricultural land to caravan sites. Our clerk has also written to the garrison commander at St. George's Barracks for their position as this land is close to the training facilities and MOD land and BBOWT who closely monitor the natural environment in this area. The consultation period appears to finish on 17th February. The website allows for individuals to comment on applications. You can also write to the district council with your comments. The parish council will be meeting this week to compile a response when more information becomes available. Please advise your neighbours. This email list probably only goes out to a third of Piddington's households. I will send updates as soon as the council receives them. If you allow a dog in your charge to foul any area to which the public has access you are committing an offence. The parish council provides bins in public areas for the use of dog owners. Cherwell District Council is responsible for monitoring dog fouling, the issue of fixed penalty notices and for initiating court proceedings against offenders. By law dog owners must pick up any mess made by their dogs. If owners do not clear up behind their dog and evidence is available CDC will investigate and prosecute them. The penalty for not clearing up behind your dog is up to £1,000 if taken to court, but there is also provision for a fixed penalty scheme with a fine of £50 in England. The published report of the inquiry mentioned below, to which several Piddington residents submitted evidence, was ordered by the House of Commons to be printed 28 January 2015. Download a copy of the report here. Network Rail have announced that due to the Secretary of State having to sign an order for compulsory purchase of the land required, the embankment stabilisation will not now start until April 2016.